It is natural for parents to want to help their children to maximise their capacity for learning and thinking, but it can sometimes be difficult to find ways that foster children's cognitive development. There are a number of things that parents and others who care for children can do, that will help children to become free thinking individuals who find it exciting to learn new things. Learning begins at birth, so parents should make an effort to expose their babies to a variety of stimuli to encourage the baby's natural curiosity and quest for knowledge. Talking, singing, and reading to babies is beneficial, and it is important to continue to do these things as babies grow into toddlers, preschoolers, and school aged children. Learning is an ongoing process, ideally one that continues throughout the lifespan, so parents should continually look for ways to encourage their children to experience new things and keep on learning. Much of children's learning is accomplished whilst they are engaged in active play. Kids experiment with spatial issues, logic, creativity, language development, and social interaction when they play, and each encounter adds to their knowledge. Parents can help by providing ample time for free play, with some time set aside for more structured activities. Playgroups and classes can help kids to develop physically, cognitively, and socially, making them valuable childhood experiences. Kids learn a lot from one another, from discovering new ways to play with toys, new games, and even how to work out disagreements when they arise (and they will!). 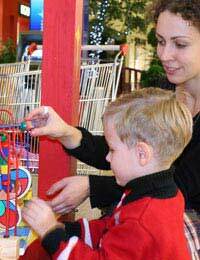 Educational toys are increasing in popularity, and many parents find them to be beneficial. Many toys can be educational, even those not specifically labelled as such. Providing kids with an assortment of art supplies, puzzles, books, building materials, and other traditional childhood basics can be used to spark their imaginations, vital for learning and thinking. Activities that require children to utilise their problem solving skills are most recommended, encouraging kids to think for themselves. As kids get older, intellectually stimulating gear such as telescopes, chemistry sets, microscopes, building sets, and scaled down versions of adult apparatus such as woodworking supplies, gardening tools, or kitchen gadgets can encourage children's continued learning. Kids naturally want to be helpful and useful (don't we all?) and parents can play on this desire to their children's benefit by posing questions to them that will not only allow them to be helpful, but will promote their thinking and problem solving skills. Asking kids to help out with shopping, determining the best deals on various products, measuring ingredients while preparing family meals, planning outings and holiday excursions, or helping to fix broken household items are all ways that parents can offer real-life learning opportunities for their children. Sometimes, kids know about things that their parents don't and are all too happy to share (and show off!) their expertise. Parents who allow their kids to teach them things, from how to reach level five on their video games to turning on a scooter without falling, provide their kids with practical experience in leadership and confidence building skills, important for continued learning. One of the very best things that parents can do to encourage their kids to be enthusiastic learners is to provide good examples for the children to follow. Parents who pursue learning opportunities throughout their lives, enrolling in classes to advance their careers as well as for pleasure and being adventurous in approaching new experiences give their children working examples of the benefits that come from being active learners.